Spring and summer are seasons of adventure in Santa Fe. The city is bright and exciting, and outdoor activities like hiking, rafting, and biking are waiting just outside city limits. With tons of family-friendly adventures to choose from, there’s never a dull moment in The City Different. So before you go calling the babysitter, discover 10 of the best family experiences Santa Fe has to offer. Enter a fantastic realm of stories and exploration at Meow Wolf: House of Eternal Return, which is home to an immersive art experience unlike any other. Show the kids a one-of-a-kind universe and go on a journey across multiple dimensions through magical portals and secret passageways. This place is all about exploring a pure expression of human imagination. Come festival season, El Rancho de las Golondrinasc is a special place where history comes alive. Part historic landmark, part museum, part real-life experience, “The Ranch of the Swallows” offers a closer look at the culture of New Mexico. Once a strategic spot on the Camino Real, the Ranch is now a fun and interactive portrait of centuries of Santa Fe history—and living proof that learning can be fun and exciting! Note: this museum is closed November through April. Speaking of fun ways to learn, the Santa Fe Children’s Museum is devoted to exactly that purpose. True to Santa Fe’s own style, the Children’s Museum offers a different approach to education, with dynamic hands-on exhibits that’ll keep kids energized, entertained, and inquisitive for hours. And don’t be fooled by the name: parents are encouraged to learn and play, too! Santa Fe’s vibrant culture shows through at the Museum of International Folk Art. This is the perfect place for the whole family to get creative, with interactive classes and unique cultural experiences from The City Different and around the world. The best part? All children under 16 get free admission! There’s nothing quite like the Harrell House Bug Museum. Featuring thousands of insects, lizards, and other crawly critters, Harrell House is home to some of the rarest and largest specimens in the world. In fact, you and the kids can even get up close and personal with some of the exhibits. Just a short walk from Santa Fe Plaza, the Georgia O’Keeffe Museum is a tribute to one of America’s greatest artists. From her iconic works of art to an in-depth look into her creative process, there’s plenty to spark the imaginations of everyone in the family. The museum is also home to an art-inspiring hands-on experience for kids and families that gives kids and adults a chance to express themselves, with additional special events throughout the year. Whether you’re an ace in an apron or just learning your way around a spatula, there’s a cooking class for you and your family at the Santa Fe School of Cooking. From fun demonstrations to hands-on cooking experience, your whole family can get a taste for authentic Santa Fe cuisine. Don’t forget: cooking classes mean eating classes, too! When the kids start to climb the walls, why not give them an actual wall to climb? At Santa Fe Climbing Center, the whole family can take on the exciting challenge of rock climbing—and have fun doing it. Choose from classes for all ages, send your kids on spring and summer adventures and help them find their footholds. With a vibrant atmosphere and exciting modern feel, Santa Fe Railyard Park is the perfect place for families to enjoy an afternoon under the sun (the city experiences at least 300 days of sunshine a year on average). Enjoy time with the kids in the beautiful play area, then take in the sights on the hiking or biking trails. When play time is over, relax with a tasty picnic in the shady groves or gardens that line the park. Like some of the best family vacations, this list starts—and ends—with great food. At the Santa Fe Farmer’s Market, held year-round at the Santa Fe Railyard, you can taste, see, and smell all the best parts of Santa Fe flavor. There’s an incredible variety of local foods; keep an eye out for the booths lined with chile ristras, adding color and spice to an unforgettable experience for the whole family. The fun and excitement of Santa Fe isn’t just for adults. 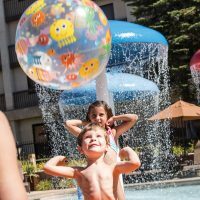 Bring the kids and see how Santa Fe stays true to its reputation as The City Different when it comes to family vacations. 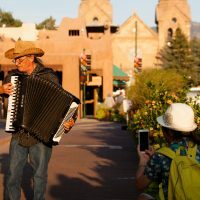 For more events, recommendations, and places to visit, head to santafe.org.